DMI Over Door Traction Set by Briggs Healthcare is for use over a door. This Traction Device is easy to use and easy to set up. Just mount the traction kit to any closet door that is not currently being used, set the needed weight by filling the bag with water to the desired graduated scale and then put on the head halter as directed. The traction device can bring needed relief for individuals with neck pain or cervical pain. 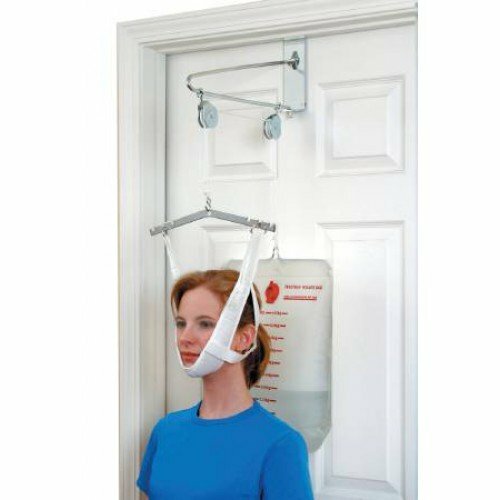 The Duro-Med OverDoor Traction Set provides Cervical Traction Therapy to patients at home or at the office when relief is required. The amount of traction force is easily adjusted by adding or removing water from the vinyl water bag with graduated scale. Hook and loop adjustable strap fit most patients. Adjustable traction force to meet patient needs. Traction kit supports up to 20 pounds of traction force. 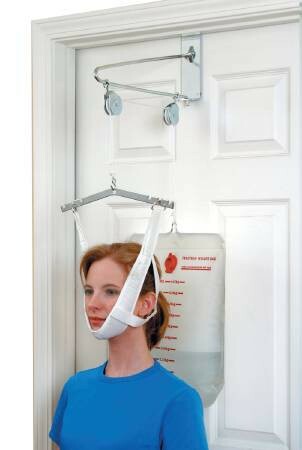 Head halter is padded for patient comfort. Closure: Hook & Loop Fabric. Application: Over door traction set. I need a replace water bag.Can I just buy a bag? Water bags cannot be purchased separately with this unit. This overdoor traction kit was easy to set up and use. I like the ability to easily control the amount of weight by merely adding or pouring out water. Make sure you use a door that is not in use so that someone in the family does not open the door while you are in traction.